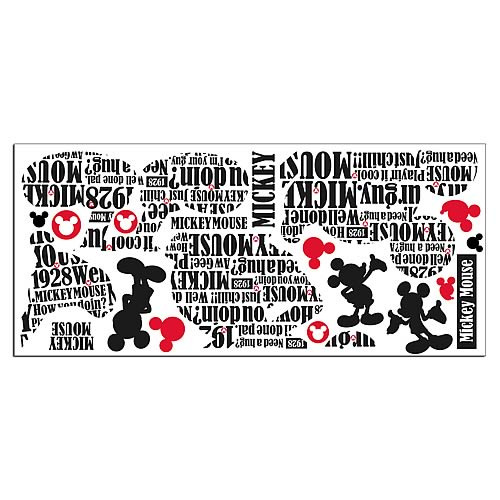 Bring the magic of Disney's iconic Mickey Mouse to any wall with this clever Mickey Mouse Typography Giant Peel and Stick Wall Decal. Several of Mickey's memorable phrases, like "aw gee! ", combine together to create a silhouette of his figure. Additional silhouette decals are included and can be used to decorate accessories, furniture, laptops, or any other smooth surface. A great decorating idea for Disney-themed bedrooms for kids, and an excellent gift for that Mickey Mouse fan in your life! Measures about 29 1/3-inches tall x 24 3/4-inches wide. Ages 3 and up.